The last decade has been challenging for many established firms. The oil crisis, the financial crisis and the continuously increasing innovations on information management challenge firms to think different about their business. The environment in which firms perform their business becomes more competitive and more dynamic. In particular established, capital intensive firms face the problem of not being able to change their business model. 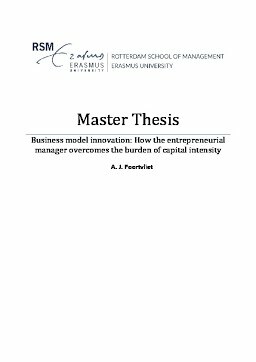 This thesis explains how established, capital intensive firms innovate their business model over time and acquire a competitive advantage by doing so. In particular the resource based view of the firm plays an important role in this research since it explains some of the barriers and biases management of these firms encounter when trying to renew the business model. Based on literature review, three propositions are developed to answer the central research question. Research was conducted in the maritime industry of Europe. Three cases studies were conducted, which include interviews with top management of these firms. The firms and their business model innovation trajectories are analysed. The conclusion is that all firms within this research innovate their business model customer-driven for a certain period in time. Management of established, capital intensive firms, is reluctant to use the lever of technology if there are uncertain, long term rewards. They mainly innovate their technology driven by customer, often with co-creation. But when the competitive advantage weakens, firms strategically renew their organization and management to assure a competitive advantage. Implications for management include ways to promote business model renewal. In particular the entrepreneurial role of top- and middle management is addressed.